When faced with a challenge, Bernard Tschumi relies on conceptual power. 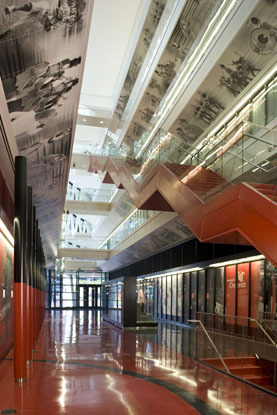 For a multipurpose athletics facility in the University of Cincinnati's tightly packed "Varsity Village," the architect chose a most intriguing site, though perhaps the most difficult. The big idea: Squeezed into a sort of boomerang shape by existing fields, a stadium, recreation center and an arena, the new building could capture the residual space as a hub of campus athletics. Then came concept two. To enhance its functionality and animation as a central terminal, Tschumi envisioned a full-height atrium running through the doglegged floor plan. To create this form-and to span an existing mechanical area that had to be column-free -- the architect conceived of a steel diagrid frame, effectively producing a five-story truss. 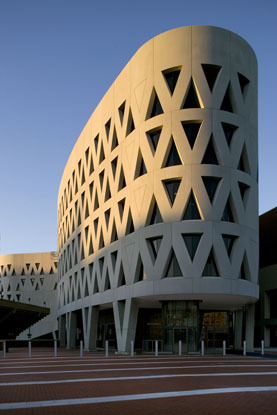 Outside, the concept generated a memorable curved façade of precast-clad triangular cutouts. Inside, it produced a grand space that knits neighboring sports facilities together. Despite its unlikely shape and siting, the building contains a cathedral-like space -- a veritable shrine to the UC Bearcats. Overhead there's a third signature move. Seizing on this dramatic interior, Tschumi worked with designer Eva Maddox to create an installation called "Heritage Hall" showcasing the university's achievements. 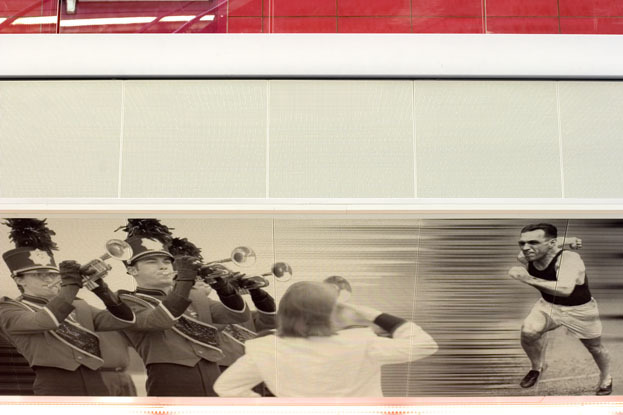 Sepia-toned graphic murals are emblazoned onto Luxalon® metal ceilings by Hunter Douglas. The flatness and flush joints of the system keep the photographs looking continuous and clean. 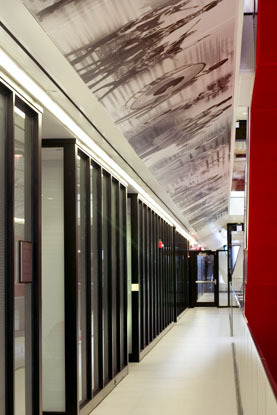 The perforated planks also enhance the acoustical performance in the reverberant space. 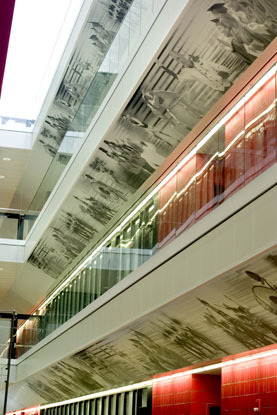 The only echoes of the murals -- made of up to 95% recycled material -- are the matching graphics on glass office partitions below. 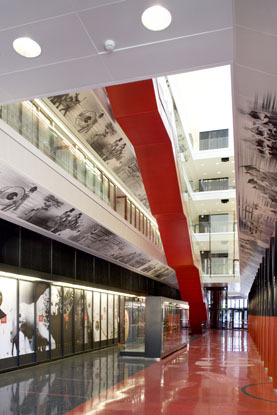 According to creative director Brian Weatherford of Perkins+Will Eva Maddox Branded Environments, the graphics were applied directly to the ceiling panels by means of a digital printing press. "It's a flatbed printer that can accept material up to two inches thick," he explains. 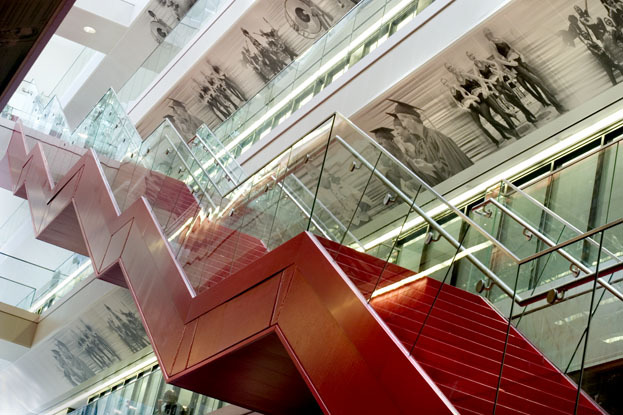 "Originally we thought we might apply film so that the images would be changeable, but because the ceilings are perforated with an acoustical backing, we said, 'What if we print right on the metal instead?'" The imagery was developed to express university athletic director Bob Goin's vision of touting both sports and academic programs. Along with its four-story-tall cantilevered trophy case, the museum could inspire students and entice new recruits. The resulting environment functions as both a destination and scenic relief within what is meant to be a new campus pass-through. 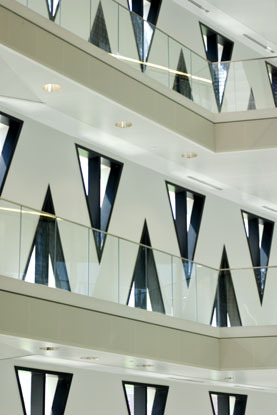 "The atrium connects the north and south ends of campus," says Kim Starr, project manager with Bernard Tschumi Architects. "The building spans the campus areas known as 'Main Street' to north to the sports fields and facilities to the south, so it seemed like a natural path through the building. Students already tend to use U.C. buildings as cut-throughs." 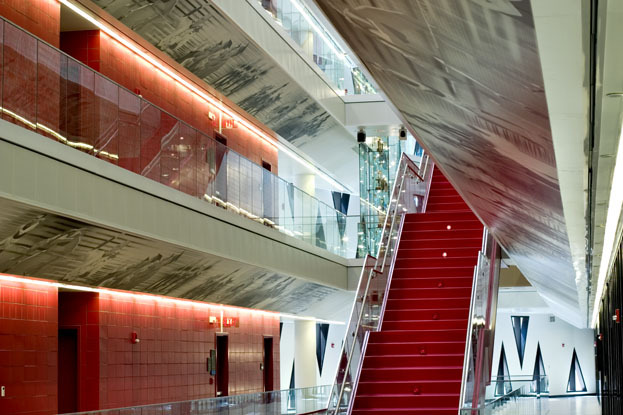 The atrium idea has invited comparisons with Tschumi's Lerner Hall at the University of Columbia in New York City, where another grand space acts as hub and connector, surrounded by a similar program of uses. Yet the University of Cincinnati presents presented a unique opportunity. The master plan for its rather dense campus has been widely hailed as a paradigm for urbanizing campuses. Conceived by the planner and landscape architect George Hargreaves, the strategy is a connective one, with "'force fields' derived from historic quadrangles [to] guide new infill development," he has explained. The results weave the character of the nearby Burnet Woods through aligned grids that reinforce the campus quads. A significant feature of the master plan has been commissioning major new architectural works. "Over the twenty years, the university has invited many architects of international standing to complete buildings there," Starr explains. Among the other new U.C. landmarks are a recreation center by Thom Mayne, an arts center by Peter Eisenman, Frank Gehry's molecular studies facility, and the engineering and research center by Michael Graves. The list is longer, however, including works envisaged by Henry Cobb, Charles Gwathmey, Buzz Yudell, and David Childs. 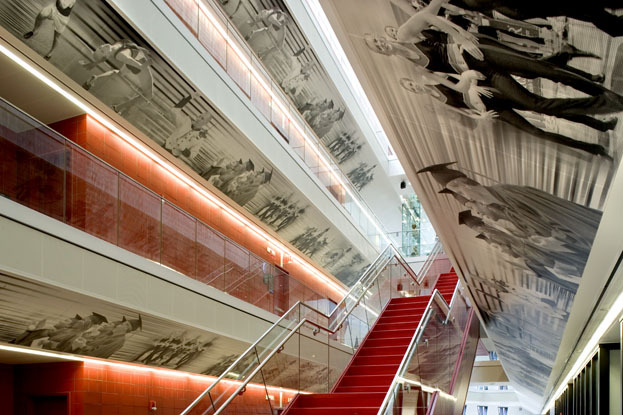 So Tschumi's Lindner Center lives amid good company. While it presents an impressive image, Tschumi's diagrid structure -- an idea that the architect toys with from time to time -- seems especially at home on this star-studded campus. The main reason is that he deferred to existing context and circulation patterns, dropping his concept directly into the path of the oncoming student body. His ultimate vision, though contorted and crafted to suit this site and the university plan, stands out as a uniquely poignant expression of the U.C. experience.